Sometimes I have trouble thinking of what to write about. Today, for instance. I have a stockpile of ideas, but none of them seemed to interest me. Fortunately an adequate topic was right here under my nose. Not my upper lip. Smells. Specifically, the fact that the difference between good and bad smells can so often be a seemingly arbitrary factor. Join me, won’t you? … By the way, that sound you hear is me scraping the bottom of the barrel. Whether a smell is good or bad depends largely on context. For example, Bacon. Is there anything in the world that smells better than bacon? The answer is no, so long as the smell is coming from a plate, or an otherwise culinarily appropriate location. If someone is showing off their new baby and it smells like bacon, suddenly the love is gone. “Say… Dan? Your son smells like sizzlin’ swine. Look into that.” Similarly, if you take off your pants at the end of the day and get a nice whiff of bacon, it really isn’t a nice whiff at all. Here the good or bad nature of the smell depends upon its source. An out of place smell is probably a bad one. Along the same lines, I had fried chicken not too long ago. My mom uses Parmesan cheese in the breading. (Recipe avaliable upon request.) It smelled great, and strangely familiar. Slowly I realized that the last time I had puked, the smell that lingered in my nose was exactly the same. I hadn’t eaten Parmesan Cheese. I’d eaten some manner of hot pocket from a college vending machine. (Yes, I was asking for trouble. I realize that NOW.) This is a case where the process that produced the smell made the difference. Crispy, Golden brown chicken frying up in a pan? Scrumptious, delightful, good. A medium sized hunk of fermenting, half-digested vittles? Hideous, nauseating, bad. There are certain things that, no matter how enchantingly aromatic their aftermath, will never be considered a pleasant smelling affair. Vomit falls under this category. I don’t care if you just got through eating a fine salad of rose petals steeped in perfume, if it comes flying out of your esophagus, that is not going to be a smell that you will dab behind your ears. Need more illustration? Okay, how about a more practical example. I love White Castle burgers. That’s sliders, for you people in the know, and Krystal burgers for our friends in the south. These are some fabulous things. A burger you can swallow without chewing? Truly the fat man’s friend! And they smell delicious, but as with all great things, there is a terrible price to pay. They bring about flurries of farts. I mean, just blast after blast. From the moment you take your first bite to the moment the last protein strand is metabolized, you’ll be experiencing a warm wind from the south. It is almost frightening. And the farts smell IDENTICAL to the original burgers. Not just reminiscent of the original burgers. We aren’t talking about a distinctive quality that allows you to identify the source. It is the same exact smell. The only thing is, now this smell comes not as a herald of impending deliciousness, but as a harbinger of intestinal turmoil. This is a smell that is good or bad depending on direction. Here, I think, is the key. When sound is generated by an object moving toward you, the sound waves are closer together, producing an upward shift in the perceived frequency, making them sound higher pitched. Likewise when objects move away from you, it produces a lower sound. This phenomenon is known as the Doppler Effect. I think that our attitude regarding a smell is dependant on theoretical waves of smell. Higher frequency scent waves are pleasing to us (food moving toward our mouth) while lower frequency scent waves are distasteful (Poop moving away from our butts.) Certain objects, like a frying pan or a griddle, allow the scent waves to accelerate, much in the same way helium produces a higher pitched voice. Likewise other objects, like the components of feces or vomit, decrease the pitch. This new theory of scent perception shall from this point forward be known as the Nasal Doppler Effect. I realize that this is a new hypothesis, and there are holes in it. 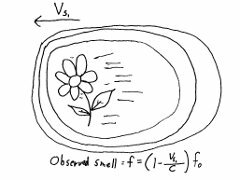 It cannot explain contextual alterations in scent perception like the aforementioned swine smellin’ son, for instance, but I believe it has merit. Perhaps I should submit it for consideration for a genius grant. Who knows? I could have discovered a brand new approach to the age-old problem of body odor. Rather than trying to cover up your smelly parts, you thrust them swiftly toward the nose of your guest, thus utilizing the Nasal Doppler. Even if it doesn’t work, it should at least be good for a laugh. Think about it, and do us a favor and share your thoughts. Comment. COMMENT! FOR GOD’S SAKE COMMENT!